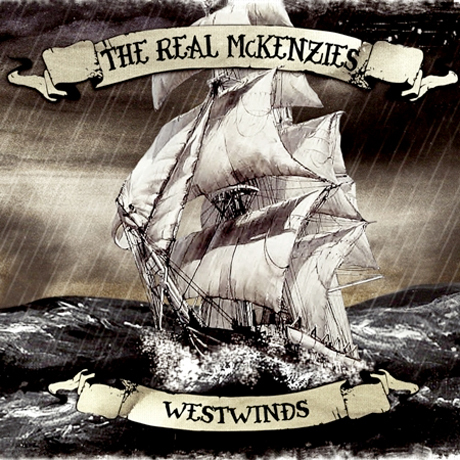 It's been almost four years since Celtic punk outfit the Real McKenzies released their last studio album, Off the Leash, but 2012 will see the long-running unit donning their kilts again for the new album Westwinds. The group's label Fat Wreck Chords recently confirmed that it will issue the Vancouver act's next full-length on March 27. That's its nautically themed artwork up above. A statement from highland bagpiper Gord McKenzie (aka Gord Taylor) explains that the BC-based band took off to the other side of the Rockies to track the disc with Steve Loree at Nanton, AB's Crabtree Studios. While recorded in a professional studio, McKenzie describes Westwinds as the natural follow-up to the acoustic pub gig captured on 2010's Shine Not Burn. "Our main idea for Westwinds was to create an all-electric album for our fans (to follow the all-acoustic record, Shine Not Burn)," he explained. "The goal was to release a great collection of songs that would not only make all of us McKenzies proud, but to also make that point that we're not going anywhere anytime soon." You can check the tracklisting below. Fat Wreck Chords promises to drop an MP3 from the album shortly. 3. "I Do What I Do"
5. "My Luck Is So Bad"
6. "The Massacre of Glencoe"
11. "My Head Is Filled With Music"
13. "Pipe Solo - Francis Fraser"